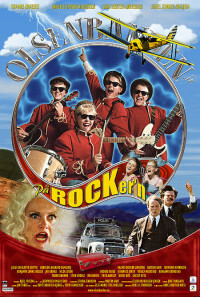 The movie is set in Oslo in 1960. When the new TV channel NRK opens they have a talent competition where the winner gets 50,000 kroner. And Olsenbanden Junior just has to get in on this, and they come up with the band "The Dynamites", but they face stiff competition from Biffen's band "The Biffers" and Herman on piano. After a tough time "The Dynamites" win the competition. They get discovered by Pop-Johansen and he wants to make them big rockstars in America.